The 15th annual Leavenworth Accordion Festival includes workshops, jam sessions, a film/video series, a parade, and four nights of concerts and dances. Performers include Lynn Marie, Janet Todd, and S-Bahn. For polka fans, there’s also the International Polka Fest (Carleton, MN) and the Syracuse Polish Festival (Syracuse, NY). Check our calendar for more great accordion events in your neighborhood. Make An Accordion Awareness Month Pledge! It’s June 1st and that can only mean one thing… it’s the start of Accordion Awareness Month! Established in 1989 by our pal Tom Torriglia — formerly of Those Darn Accordions, now with retro-Italiano band Bella Ciao — Accordion Awareness Month was created to spread the word about the accordion’s resurgence in popularity and to educate people about the accordion’s true musical potential. Basically, the same mission we’ve adopted at Let’s Polka, except we do it year-round! You have until the end of Accordion Awareness Month to make your pledge, so get out there and become an accordion awareness ambassador! Make Music New York is a unique festival of free concerts in public spaces throughout New York City, all on Sunday, June 21st, the first day of summer. Along with hundreds of individual concerts, this year’s MMNY includes a type of gathering called “Mass Appeal” where hundreds of musicians perform pieces written for a single instrument. And, you guessed it, there’ll be special event just for accordionists. Accordionists of all shapes, sizes, and abilities are encouraged to join the accordion gathering at the Old Stone House in Brooklyn. 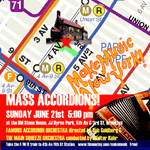 You can participate in the performance of a new piece by composer Bob Goldberg for the Famous Accordion Orchestra, in which visitors discover an “accordion forest.” Players are also invited to play-along to some old favorites with the NYC’s all-female Main Squeeze Accordion Orchestra conducted by Walter Kuhr. See the listing on our calendar for more details, including RSVP information so they know how many squeezeboxes to expect. Giant Accordion on the Loose? “Several meters” high? I wonder if this giant accordion is related to this one built by Giancarlo Francenella in Castlefidardo, Italy. That accordion — which is more than 3 meters tall and 2 meters wide — requires two people to play it, one on the keys and another to push the bellows. (Sounds like the punchlinke to a “how many accordionists does it take to screw in a lightbulb” joke…) If you want to see it in action, the accordion was recently transported to the Tate Modern in London for an exhibition and will be there through April 26th. I ran across this teaser video for “A Few Accordions Short of a Record” — an upcoming documentary on the annual Kimberley International Old-Time Accordion Championships in Kimberley, British Columbia, Canada. It’s one of the largest accordion festivals in the world, drawing thousands for a week full of concerts and competitions. In 2005, attendees set a Guinness world record for the largest accordion ensemble with more than 644 players. (That record was broken a month later at the Newfoundland and Labrador Folk Festival where 989 accordionists participated.) The video suggests the film will be complete by the summer; I’ll keep my eye out for more details. All too often, we find ourselves writing about polka hotspots right as they’re about to close. So it’s a nice change of pace to report that, after being closed for a year, Maryland polka landmark Blob’s Park will re-open Wednesday night with a New Year’s Eve dinner/dance. Max Blob’s Bavarian Biergarten (aka “Blob’s Park”) first opened in Jessup in 1933 and was a center for polka dances until last December when owner John Eggrel retired and the land was earmarked for development. Now Max Eggrel, great-nephew of founder Max Blob and brother of John, has leased the land and is hoping to keep the place open for at least three more years. Great news for Maryland polka fans — now get out there and dance! Trying to fight that tired old stereotype that accordions are just for old men with lederhosen? 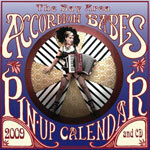 The 2009 Bay Area Accordion Babes Pin-Up Calendar should do a thing or two to change that perception. This glossy, full-color calendar features stylized pin-up shots of 15 local accordion babes including Tara Linda, (Mad) Maggie Martin, Skyler Fell, and more. The calendar will sell for $20 and includes a companion CD with tracks by many of the ladies featured in the calendar. It’s the perfect holiday stocking stuffer. I’ve always loved maps; as a kid, I spent hours poring over National Geographic maps at my grandparents’ house. So I’ve combined two of my favorite hobbies into our new map of accordion events across North America. The map includes all of the events currently listed on our accordion events calendar, from Arcata to Wausau. Just zoom in on your area and click on a pin to get details about a particular event. Of course, some squeezebox hotspots (New York, San Francisco, New Orleans) have more activities listed than others, and that’s where you come in. If there’s an event in your area missing from our list — your band is touring, your accordion club is meeting, etc. — let us know. With your help, we can build the most complete list of accordion events anywhere!